While I’ve done a few posts on children’s bridal wear, I haven’t devoted myself to the ‘little girls only’ wedding yet. Imagine a parade of pretty little girls ranging in age from 3-13 processing their way through a garden in delicate organzas. Although this line-up doesn’t fit the typical wedding, the ‘little girl’ trend is different and delightful. For those of you considering a ‘wee chic’ wedding, designer Ulrika Bogo offers some fantastic kid couture. 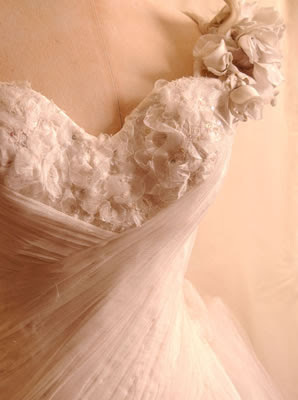 Hand-rolled florals, invisible seams and closures, a pleated bodice. All these are couture touches that take a dress out of the ordinary and put it into the realm of a work of art. Since a custom gown is 85-90% handmade, the hours it takes to complete one are long and complex. Regardless, it can be rewarding for both the designer and dressmakers involved. When we think of couture we usually imagine European ateliers where the level of fabrication and fit are taken to the highest level. These gowns by British designer Elizabeth Emanuel for 'Art of Being' are ethereal masterpieces, the details of each component executed with great skill. Today we’re going on a really awesome field trip. Dani over at Weddings Fresh asked me to guest blog a couple days this week. Naturally I’m both honored and elated. Dani’s been committed to bringing her audience some of the finest in wedding fashion and all the pretty things that go with it. I’ll be chatting over there pretty much about what I do here, only we’re going to be concentrating more on designers and forecasting trends in bridal fashion. Hopefully I can offer some extended insights as well as a few options customized to fit your own version of chic. . . See you over there . . . Looking for a special gift for that bride in your life? Written by David Sassoon, what bride wouldn't drool over a book full of this British pair's creations? 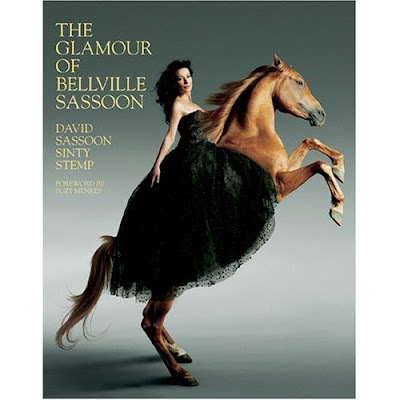 Bellville Sassoon was one of Princess Di's favorites and the famous duo's evening wear was regularly photographed on her. This soon to be released coffee table treasure is a pictographic escape through fifty-years of British haute couture. Just released, you can pre-order through Amazon and have it in time for the holidays. Just remembering when I first laid eyes on Paris Designer, Max Choul’s collection pieces. 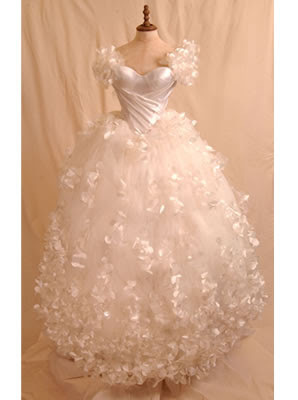 Back in 1998 a couple of his ball gowns were featured in Wedding Dresses Magazine. 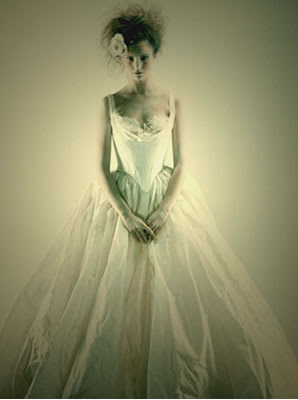 I was awestruck by the carefree spirit of these dresses, the photos almost surreal and evocative of dreams. I wanted to share some new dreams found in his latest collections. I still think he’s brilliant . 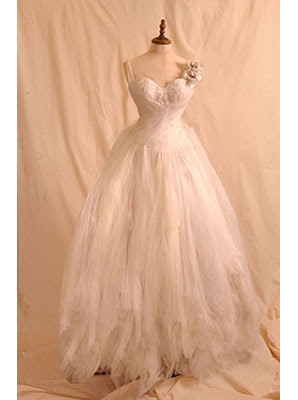 . .
Face it, most wedding gowns are worn once and preserved ever after as heirlooms. Others are donated to charity or consigned. Keep in mind you do have the option of choosing a design you can re-wear. Maybe you’re into cotton and linen. A cotton eyelet dress or linen suit can work quite well as reusable bridal attire. If you’re drawn to simpler silhouettes in functional fabrics like wool and silk jersey this works too. Knowing how to work a veil with some opera length gloves and the right shoes can really pull a simple dress into a ‘bridal look’. Consequently, the more practical you are, (as opposed to sentimental) the more likely you are to re-wear your gown. Retooling your gown is another option. So what exactly is retooling? Think of it as recycling it into another garment for regular use. Being handy with scissors and thread helps; lace can be cut away and altered into a blouse or skirt, sleeves restyled and hems shortened. Though you may not be able to envision your ‘after design’ just yet, it may take till after the wedding for a vision to come. And with the help of a skilled dressmaker you’ll see all the clearer. 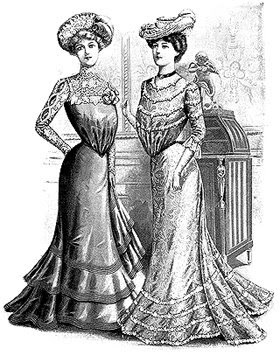 I don’t believe beautiful laces should be stored away for decades in dark attics so the idea of retooling gowns into elegant linens to be enjoyed by everyone appeals to my practical side. Bassinets in particular intrigue me, they keep the gown sentiment going as a story told through laces and silk. 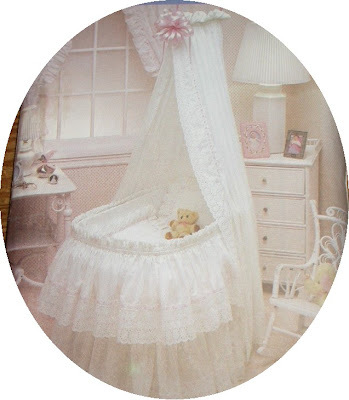 The bulk of the skirt wraps around the bassinet and your veil hangs as a head draping. If you wore a tiara you’ve created a real fairy tale. I’ve actually known brides who have fashioned table runners out of galloons of lace removed from hemlines; others lined shelves in china cabinets with smaller pieces. And don’t laugh. The skirts of some gowns have made some of the most ‘Hello Gorgeous’ tablecloths I’ve ever seen. And what of my own imported allover lace gown? 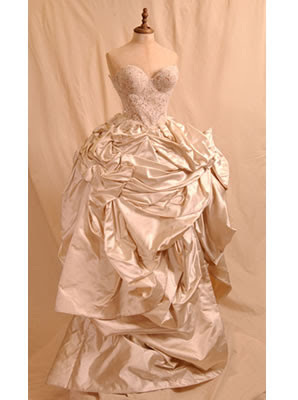 My wedding gown stood on a dress form in my design studio for years. It was the focal point to all who wandered through my door, a testament to my skill at working with lace. That is, till in the process of moving (sob, sob) it disappeared forever . . .
WHAT'S NEW IN THE GOWN GALLERY? 'Oriana' slid off the work table just in time for all those autumn/winter weddings. This is a lovely ecru brocade-faille sheath with a detachable train of the same fabric. Three hand-rolled satin florals sit on top of a gray satin sash that ties in back. Ideally this could be worn with a wrap and long opera gloves. 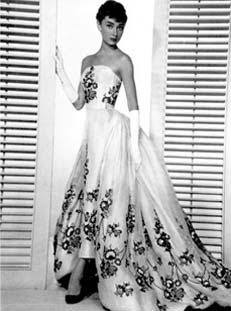 Inspiration for this gown comes from the sheath/ ball gown combo Givenchy designed for Audrey Hepburn in Sabrina. 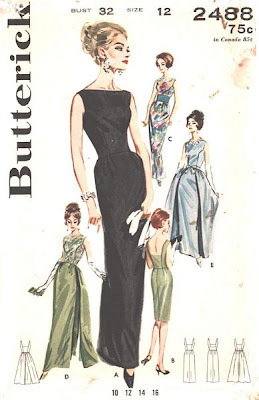 Although I didn’t use this 1950s pattern below, the lines I found in it motivated me to create Orianna in brocade; they used to use heavier fabrics for leaner silhouettes. Here’s the brocade close up. It’s luxurious and has a real stunning sheen to it. I especially love the embossed motifs. You can check out more of the gown galleries at Amy-Jo Tatum.com. Following up on my 'Ditching the Veil' article a couple days back, I mentioned hair jewelry as one of your options. If you haven't caught Portobello on ETSY do check it out. You'll find some of the hottest in hair paraphernalia. Going for that haute couture or vintage look? Try these feather/flower combos, particularly chi chi with body hugging silhouettes. It's the exact touch for evoking 1930s Hollywood glamour . . . I'm always on the prowl for the classic gown my mother could have worn and grand niece can wear today like a brand new creation. Lanvin's collection has such gowns in an array of sumptuous fabrics. Although these dresses are timeless, any fan of 'alternative' or progressive wedding fashion would find every piece the perfect back drop to work their own spin. You can see more of these confections by checking out Shine Anthony-Dharan's May 28th article for Culturekiosque. Yes, veils are still in vogue. And yes, there are more styles out there than ever, but before you make the decision to wear one, consider your options. Today, some brides are bypassing the veil, going for special touches like wide brimmed hats, fresh flowers or jewels in their hair. The idea is, if you’d rather wear a wide-brimmed hat down the aisle and it works with your gown, go for it. WREATH-Very romantic. A wreath circles the head and is interwoven with flowers, foliage and in some cases, ribbons. Florists can put these together either with fresh, artificial or dried flowers. Some variations would be those made exclusively of English Ivy or dried roses and baby’s breath. 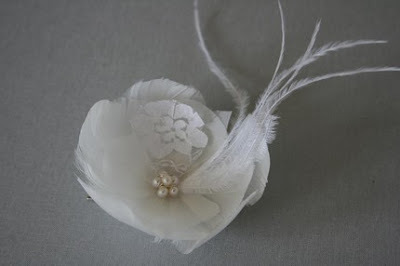 HATS are the choice of some of the world’s chicest brides like Bianca Jagger and Rita Hayworth. Once you start trying them on, you’ll see how each works with the shape of your face, your body type and gown. A petite bride can wear a picture hat as long as it’s not massive and is in proportion with the rest of her. The evening-gowned bride will need something with enough width to create symmetry with her gown. 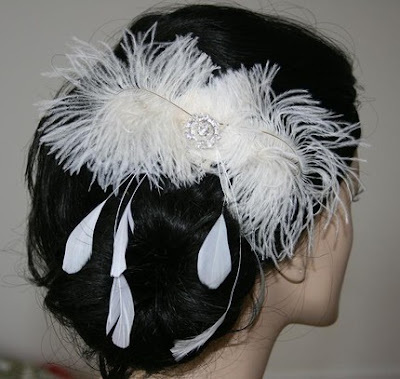 Adornments can be feathers, flowers, ribbons, drapes and poufs of netting, to name just a few. The widest assortment can be found in millinery shops. Here you’ll get lots of personal attention. And if you don’t find exactly what you want, they’ll custom make it for you. SNOOD- Another sophisticated look. A snood is a piece of openwork netting used to cover and wrap buns and chignons. They were highly popular in two eras: the Civil War and World War II. The contemporary versions that compliment evening and bridal wear often have pearls, or crystals on them. HEADBAND- typically attached to a gathered pouf veil, you can wear the headband individually without the veiling. Headband brides have that fresh, Estee Lauder look. Bands range in style from simple, narrow satin ones to those covered in pearls and crystals. A great option for hair worn down, not quite shoulder length like a bob. TIARA-Just the tiara—no veil. This is a classic look. The best tiaras are made out of crystal and rhinestone; forget the plastic pageant variety and invest in Swarovski if you can. Best when the tiara sits upon a well-coiffed up-do. 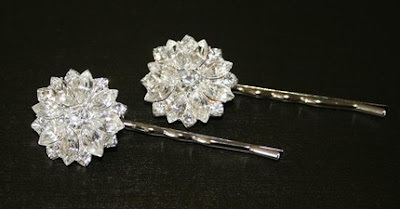 HAIR JEWELERY-These can range from Mother of Pearl hairpins to crystal adorned hair-sticks and clips. You can wear one or many sprinkled though a beautifully coiffed head. 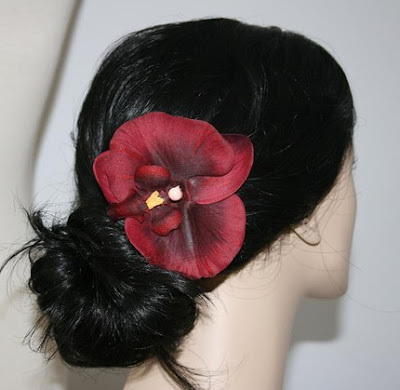 Top notch hair styling is a must to wear these properly. I just wanted to share one of my favorite photographs by Ron Greystar. Robin, the model, is in one of my gowns dancing around the lawn when Ron catches her in one of those mid-air leaps. Because the photo is over exposed she comes out looking sylph-like like a spirit . . . . I think this picture captures what a bride feels when she's wearing the right gown. She levitates . . . The Muse has been visiting ever since I got back from my big shopping jaunt. Tuesday I was in Thai Silks in Los Altos and came across this sumptuous array of silks. 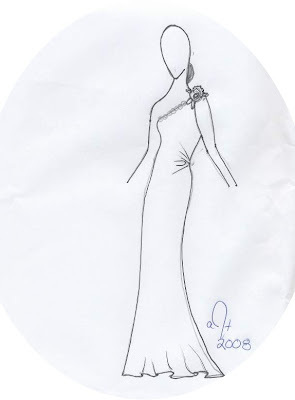 The above sketch is one of the evening gown silhouettes I have planned for 2009-10; it was inspired by the embroidered chiffon pictured below. The embossed chiffons I found there still intrigue me as I've been using them for years. Looking at the rack below, visions of sugar plums danced in my head. I'm not kidding. That's all it takes to get me going--a rack this size with some of the most exquisite stuff from the east and I have thousands of options . . . . Designing bridal gowns from the ground up has been my life’s work. Keeping those gowns white and spotless before the wedding has been as much a challenge as the design itself. Once delivered though, the gown is all yours, to have and to hold in a real world rampant with dust, blood and household pets—all potential accidents just waiting to happen. Next find a hook. A chandelier would be great if you have one. So would hooking it to an armoire or highboy. Cover the floor below your gown with a clean sheet and let the train fall. This will prevent wrinkles. Ideally the room you hang your gown in is low on traffic. No spare room? Okay, find an empty closet or one with enough room to accommodate the volume of your gown. Actually, hanging your gown on a dress form that is dialed to match your own measurements would be optimal. I know, I know, you don’t sew but if you can borrow one from a friend or if you find one cheap in a thrift store, grab it. Here’s another option for storing your dress especially if your wedding is more than three months off. Lay your gown on a spare bed or sofa and spread it out. This will ease stress caused from hanging. Some suggestions about pressing. If your gown is made out of tulle, don’t you dare press it! Steam it instead. The same goes for your veil; ironing scorches tulle. Pressing wrinkles out of your gown is done with a cool, dry iron over a piece of broadcloth or muslin, called a press mitt. Forget worrying too much about wrinkling your gown going to and from the ceremony. Just push the bulk of your skirt aside once you’re in the car. Did you know Victorian brides have us beat when it comes to going green? Tradition was, they not only wore their gown to exchange vows in, a bride of yesteryear was expected to wear her gown out and about. That’s right, she wore it to the opera and dining at Delmonico’s for about a year till everyone knew her status. In other words, a bride could revel in her bridaldom while putting some mileage on her gown. So how come we're not out there reinventing this trend? Whether you’re preserving or consigning your gown after the wedding you’re going to need to find a cleaner that specializes in wedding gowns. Specializing means years of experience as in: just about every time you drop in to pick up your silk blouses a couple Vera Wangs are ready to move out. Expect common wear and tear after your wedding day to be dirt and grass stains along the hem and train, makeup stains inside the bodice, a torn seam, bustle hooks missing. Oh yeah, and the proverbial splash of red wine on the skirt. After cleaning your gown should be professionally pressed even if it will be stored away in a box. Remember to ask it be packed in acid-free tissue in an acid-free box to prevent any staining. Remove any dress shields or bra cups, otherwise they’ll fragment through the years, soiling arms and bodice. What do you think? I want your opinions on what designer's work you think would best show off these Romanesque little darlings. Look for more of Camilla's beauties at Halo Shoes. 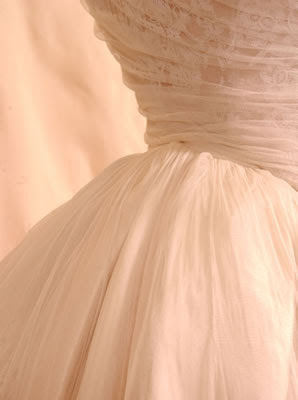 The cotton wedding dress. Easy and comfortable to wear, these dresses are surprisingly affordable. Most of us associate cotton with everyday wear. Since cotton is the ultimate in laid-back casual, we rarely think of it in terms of bridal wear. Think again. Especially about the imported Swiss eyelets in the photos above and below. Imported swiss eyelet with scalloped neck and hem. Cottons are not just for kids dresses anymore. 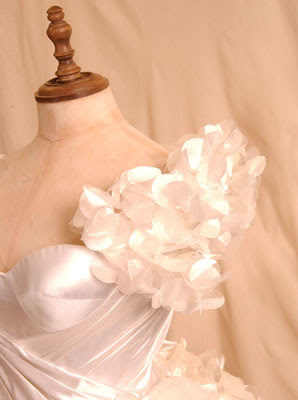 High quality cottons like these have always been a stylish option for summer brides and garden weddings. Not every bride wants the formality of silk on her wedding day so some designers are getting this message, offering at least one cotton option in their spring/summer collection. Want to see more of what's going on with the cotton collection? Visit Amy-Jo Tatum Bridal Couture. IS RENTING YOUR WEDDING GOWN REALLY AN OPTION?